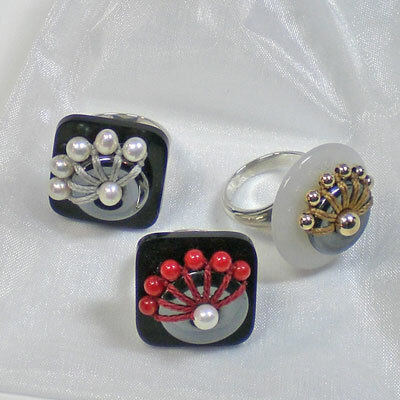 Many of my pieces feature bead edging around a donut or pie. When I first started using this technique for earrings I tried to go full circle around the gemstone, and missed the gemstone I had just fully covered. My pieces now often feature a partial covering and bead edging; how much is determined piece by piece to enhance the gemstones and the complete finished design. Square Black Horn 22mm sides + rounded corners. Circle donuts 20mm.